According to The Real Deal, tenants are hesitant to lease commercial spaces in Williamsburg due to the impending L train shutdown. Despite that one Bedford Avenue landlord left highly satisfied after they reached out to the real estate brokers Tri State Commercial in early December to find a tenant for their 292 Bedford Avenue space. Despite the rising concerns about Williamsburg’s retail vacancies, Tri State Commercial negotiated a lease for the 3,000-square-foot previously French-themed restaurant. Tri State brokers Jacob Twena and Chandler Slate found a perfect fit for 292 Bedford Ave. and the lease was signed by the end of the year. Owners of the upcoming Kill Devil: House of Dark Spirits, Jaime and Vincent, loved the storefront’s original design and decided on minor renovations. The 1980s-themed cocktail bar is bound to give customers a modern taste of a classic bar. In addition, the bar owners plan on inviting live Jazz musicians to perform a few nights a week. Kill Devil: House of Dark Spirits revealed their soft opening date to be March 1, 2018. 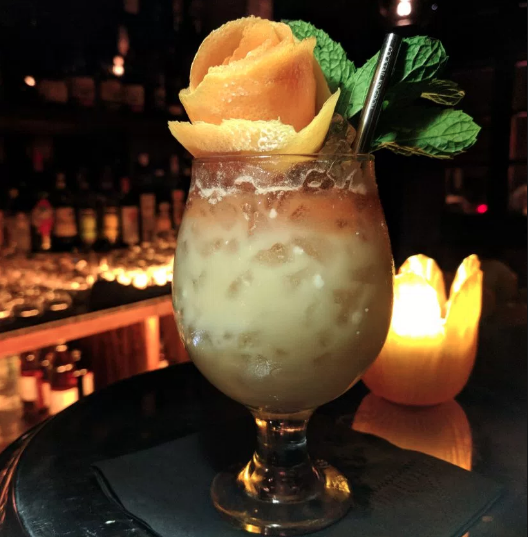 The Kill Devil: House of Dark Spirits is located at the corner of Bedford Avenue and Grand Street in Williamsburg, steps away from the Q59 bus stop and a 5-minute walk to the Bedford Avenue L train station. Cover image via Kill Devil: House of Dark Spirits.